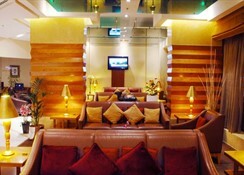 This is a deluxe hotel located in Al Rigga Street in the district of Deira- only 100 m away from Al Rigga metro station. 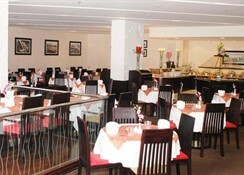 It is within walking distance of the city's business areas and famous shopping areas. 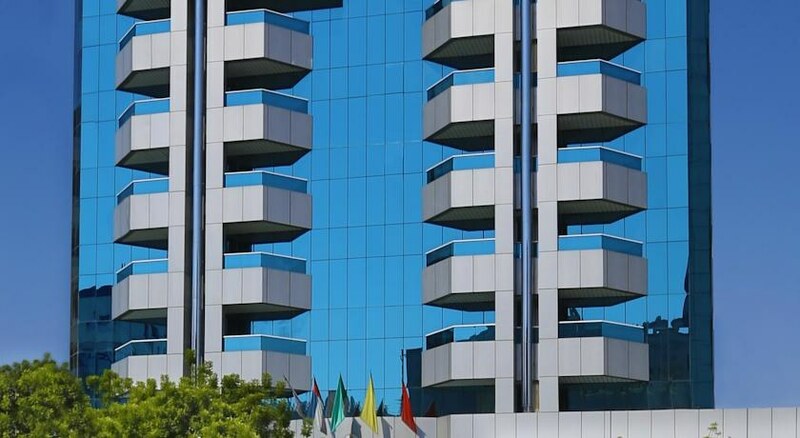 It lies just 10 minutes away from Dubai International Airport by metro.This family-friendly city hotel comprises a total of 133 rooms and suites including 7 suites and 14 junior suites. 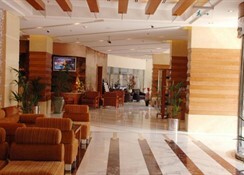 It is ideal for business travellers and holidaymakers alike and facilities on offer to guests at this air-conditioned establishment include a lobby area with a 24-hour reception and 24-hour check-out- a hotel safe- a currency exchange facility- lift access and a hairdressing salon. 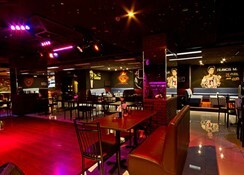 It also offers a café- a sports bar- a pub- a nightclub and restaurants as well as shops and a beauty salon. Business travellers will appreciate the business centre- conference facilities and Internet access and guests may also take advantage of the laundry and 24-hour room services. There is a car park and covered garage parking available for those arriving by car.All rooms come with a private bathroom with a shower/bathtub and a hairdryer and offer a king-size or double bed. They are equipped with a direct dial telephone- satellite TV- high-speed Internet access- a safe and a minibar/fridge. Furthermore- complimentary tea and coffee making facilities and individually regulated air conditioning are provided in all accommodation as standard.The hotel features an outdoor swimming pool with a children's swimming area and a gym. Guests can also relax on the sun terrace or in the hot tub. It also offers a daily scheduled shuttle service to the beach park and to the shopping mall.There is a sports bar offering fusion food and activities where guests can enjoy watching the sporting action and relax with friends. 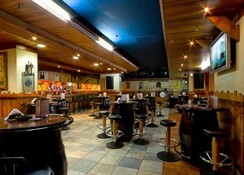 Moreover- at the ultimate Wild West theme steak house bar they can enjoy music from a live band with their meal. Parking is complimentary. 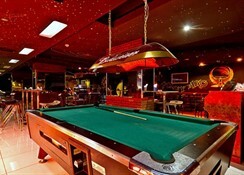 Other amenities include a relaxed 24-hour restaurant, a steakhouse restaurant and a Wild West themed restaurant/bar, plus a Filipino-themed nightclub with a pool table. There’s also a business centre, an outdoor pool, a hot tub and a gym. Well-furnished rooms with King or Twin beds, 32” LCD TV with 50 channels, IDD Telephone, work desk, High speed Internet, 4 fixture bathroom, Minibar, safety box, complimentary tea/coffee maker. Spacious rooms with King or Twin Beds, 32" LCD TV with 50 channels, IDD Telephone, work desk, High speed Internet, 4 fixture bathroom, Minibar, safety box, complimentary tea/coffee maker. Spacious suites with large living and bed room space, suitable for business meetings and leisure, with King bed, 32" LCD TV with 50 channels, IDD Telephone, 4 fixture bathroom, bathrobes and slippers, High speed Internet, Work Desk, Minibar, safety box, complimentary tea/coffee maker. Large suites with separate bedroom and living space, ideal for business and leisure, with King size bed, 32" LCD TV with 50 channels, High speed Internet, In-room fax, 5 fixture bathroom, guest washoom, bathrobes and slippers, fruit basket, Mini bar. Set 4 km from the Dubai Gold Souk, this casual hotel is also 5 km from the Dubai Museum and a 3-minute walk from the Al Rigga metro station.